Really inspired by this table setting from Bliss - amazing! I came across it last night and my jaw kind of dropped at how creative it was. 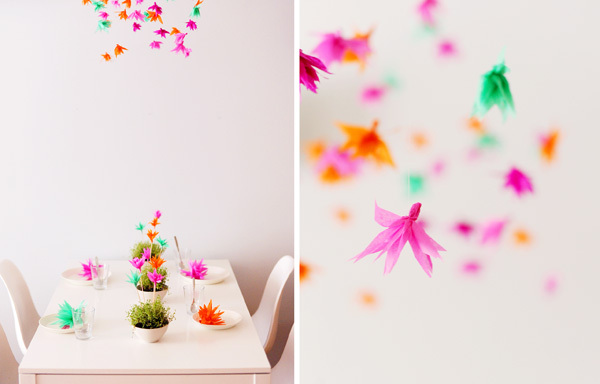 She gives it a fresh look with bright colors and unique paper flowers (see how she makes them here). I found Bliss through Justine at Urban Scarlet - she let me know about a fun diy challenge they're hosting together. And they're offering lots of party goods as prizes (yes please!). Check it out here. what a great idea! i love the colors. this is so pretty! it would be perfect for a wedding shower! I can picture those hanging in a nursery too! :) beautiful!